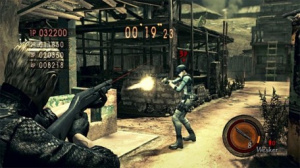 It's Wesker "Versus" Jill In The New RE5 DLC. Why you'd want to bother playing competitively in a Resident Evil game, we've no idea. But the DLC is coming and will let you do just that. The "Versus" pack was due out this week in Japan, but obviously something has gone awry as it's now slated for a release on April 9th. I bet you Japanese can barely stand the wait can you? No word on when the American/European release date is.